Twitter has always represented a bit of a raw deal for creators when it comes to monetization. Unlike YouTube, there’s no publicly-accessible revenue sharing program. If you create a piece of content that does well, there’s no way to shove an advert on it and make some money, unless you’re a massive publisher. But slowly, that’s starting to change. Twitter just announced that select US creators of all sizes will be able to insert pre-roll adverts into any video clips they upload. The feature is only open to those registered with its Amplify Publisher program. 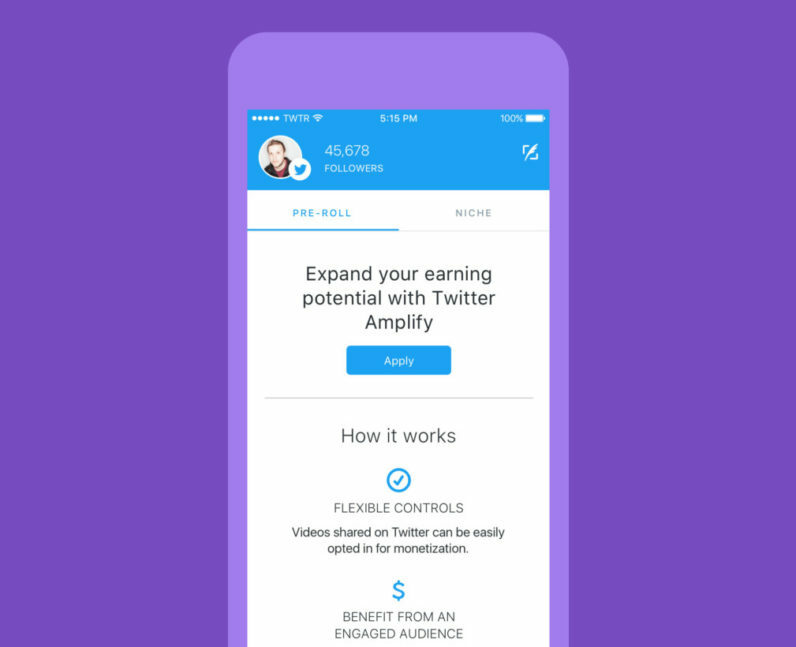 Amplify allows content creators to upload premium-quality videos to Twitter. Users will have to opt-in for adverts on a video-by-video basis, meaning that they will have to decide what videos they want to monetize. Perhaps more excitingly, there’s a non-exclusivity clause, which will allow creators to monetize their content on other sites, most notably YouTube. When it comes to earnings, Twitter has said that any revenue will be shared on a typical 70/30 ratio. There’s no word on how much creators will earn yet in terms of a CPM. This will likely vary depending on the creator’s audience, and the type of content they’ll monetize. VentureBeat’s Ken Yeung has suggested that the cost per advert might be high, due to the limited supply of created content. This move is just the latest in a number that has seen the social network try to become a more general media sharing platform. It recently updated its Media Studio and Engage apps in order to make it easier to publish video content, as well as images and GIFs. It has also opened up Moments to more creators.